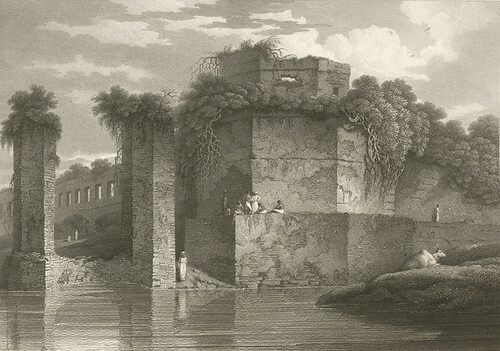 The fort of Aurangabad (আওরঙ্গবাদ), popularly known as the Lalbagh Fort (লালবাগ দূর্গ), was built in 1678 AD by the then Viceroy of Bengal Prince Mohammad Azam (মোহাম্মদ আজম), son of the Mughal Emperor Aurangazeb (আওরঙ্গজেব). The fort has a three storied structure with slender minarets at the South Gate. It has many hidden passages and a mosque of massive structure. 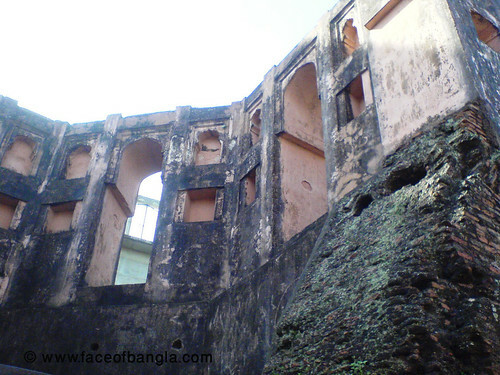 Outstanding among the monuments of the Lalbagh Fort are the Tomb of Pari Bibi / পরি বিবি (Fairy lady) and audience room and Hummam Khana (bathing place) of Nawab Shaista Khan (নবাব শায়েস্তা খাঁ), now housing a museum. 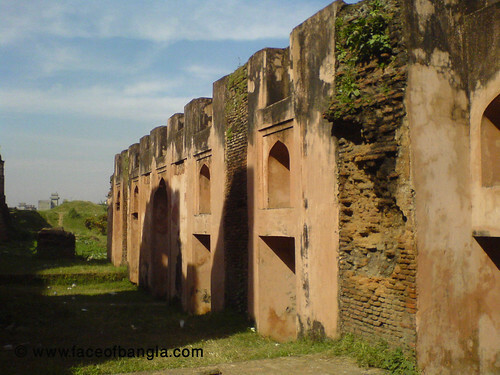 The fort was the scene of bloody battle during the first war of independence (1857) when 260 spays stationed here backed by the people revolted against British forces. It is one of the great historical places of Mughal era. A small museum is there in this fort where you will find the clothes and weapons of the Mughols. 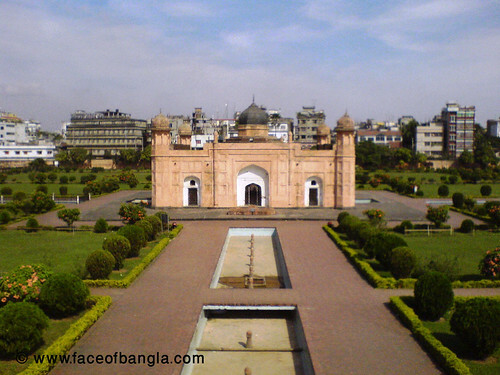 Lalbagh fort is in the old town of Dhaka at Lalbagh. It is open 10 am - 5 pm Sunday to Friday. 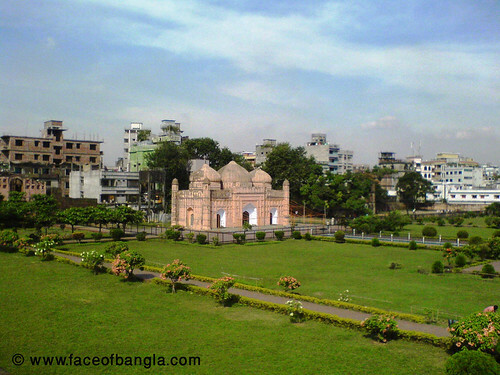 The capital city Dhaka predominantly was a city of the Mughals. In hundred years of their vigorous rule successive Governors and princely Viceroys who ruled the province, adorned it with many noble monuments in the shape of magnificent places, mosques, tombs, fortifications and 'Katras' often surrounded with beautifully laid out gardens and pavilions. Among these, few have survived the ravages of time, aggressive tropical climate of the land and vandal hands of man. But the finest specimen of this period is the Aurangabad Fort, commonly known as Lalbagh Fort, which indeed represents the unfulfilled dream of a Mughal Prince. 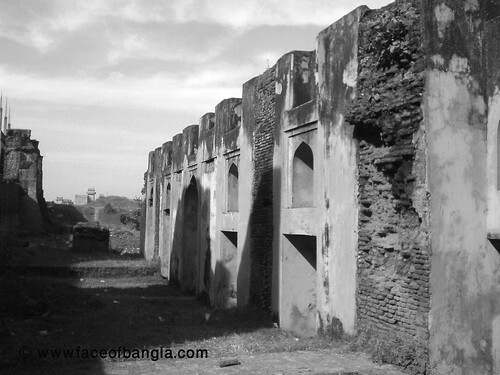 It occupies the southwestern part of the old city, overlooking the Buriganga (বুড়িগঙ্গা) on whose northern bank it stands as a silent sentinel of the old city.